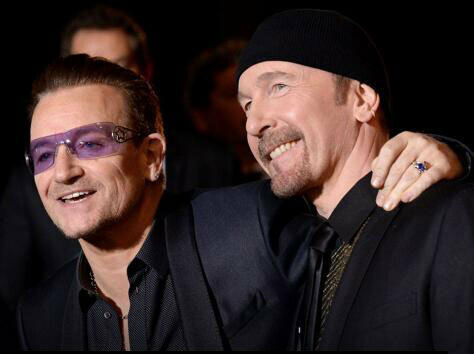 Edge and Bono were guests at the Palm Springs International Film Festival over the weekend, honoured for the band's social and political work. Here's some highlights from the speeches, after Bono and Edge received the award from Naomie Harris and Idris Elba, stars of Mandela:Long Walk To Freedom. Some 25 years ago journalist Steve Pond visited Dublin to interview the band for Rolling Stone. Steve was on hand again this weekend, speaking to Edge and Bono for The Wrap. 'The idea of U2 writing a song for a Mandela movie could make people think they’re going to get a big political song. But “Ordinary Love” isn’t that at all. Bono: Maybe they were thinking we should write a big anthem, a “Pride (In the Name of Love).” But we were more focused on the eros and the agape. A complicated love story, which is this film, deserves a complicated love song. And that’s kind of our specialty. ‘Cause when things get too straight, in terms of writing a love song, we start getting embarrassed. We come from that Roy Orbison school of dark love songs. On Sunday the musicians joined the actors for a Q&A in the festival’s 'Talking Pictures' programme. Highlights here.